The Irish Claddagh ring may be one of the world's more popular jewelry styles. With its romantic symbolism and unique design, it's hard to not want to add one to your collection. However, it's important to know the meaning behind the ring and how it got so popular. Because as with every cultural heirloom, there are many myths and legends surrounding it. One of the main legends comes from a classic love story between a 17th-century sailor named Richard Joyce and his beloved. Joyce's crew got kidnapped at sea, sold into slavery, and trained by a goldsmith. When he was finally released, he found that his love was still waiting for him, and he fashioned her the ring as a token of his affection. While these rings celebrate Irish traditions, their beautiful, timeless design looks fabulous in the modern age, and even celebrities (including Kim Kardashian West) are said to have their own. Below, we've further broken down the meaning of its design and how to rightfully wear it. The Claddagh ring is all about love, loyalty, and friendship. 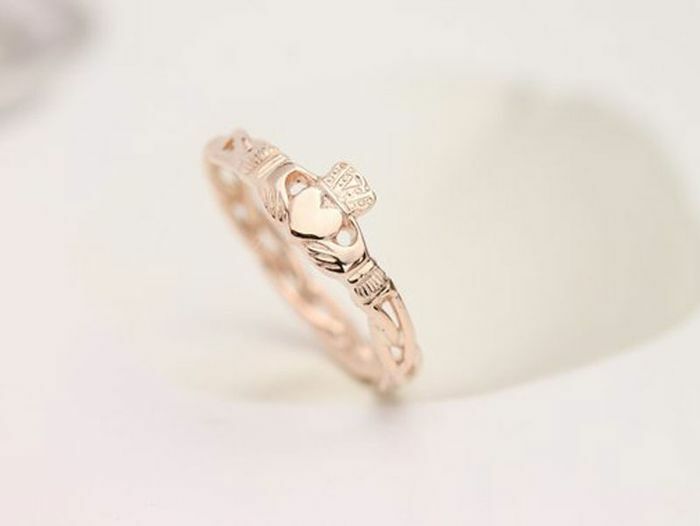 With the two hands representing friendship, the heart in the middle representing love, and the crown representing loyalty and fidelity, the ring covers every type of relationship you encounter in life. There are four ways of wearing a Claddagh ring and they all mean different things, take note. If you wear your Claddagh ring on your right hand with the point of the heart facing toward the wearer, it means your heart is taken and you're in a relationship. However, if you wear the ring on your right hand with the heart turned away from the wearer, that means you're single. If you wear the ring on your left hand with the point of the heart pointing away, that means you're engaged. But if you wear it on your left hand with the point of the heart pointing toward the hand, that means you're married. Up next, here's how to get an Instagram-worthy ring stack.